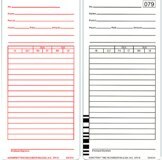 Our Acroprint Time Cards are OEM quality approved and made with the 150Lb. Card Stock for durability and resistance to moisture. The manufacturing process employeed to produce these Time Cards includes Rotary Cutting for proper sizing and accuracy, ensuring Outstanding performance when utilized in your Acroprint time clock. Don't settle for an inferior Acroprint Time Card...that could result in problems with your time clock equipment.